I promised a rant at the end of my last post. Well, this isn't really a rant more a... helpful suggestion. I was lucky enough to be treated by my wife and toddler to a night in the Slieve Donard Hotel. I love the Slieve. It's one of my favourite places in NI to go to get away from it all. The rooms are lovely, the views spectacular, the Spa reinvigorating, and the food is mouth watering. It's great that they make a big deal of all the local produce they use, from sausages, to beef, to bread. They also have a great (if expensive) wine list. They have spent time devising menu's and picking the accompanying wines. Yet when it comes to beer, the choices are the usual mediocre selection of international lagers and a token stout. The closest thing to a local beer is Murphy's Irish Stout. I mean how hard would it be to sell Harp... just joking! The Slieve, and all Hastings hotels, are among our premier tourist hotels, and this extends beyond the Slieve to all our hotels, restaurants, and bars. They have a prefect opportunity to promote the best beers we have locally – seriously even 1 or 2 beers from Whitewater, Hilden, Clanconnell, etc, would do. When I'm a tourist, even before I was a beer geek, I always tried the local brew – there must be more people out there like me! Seriously, any Americans who are into craft beer would lap up HoppelHammer, or Twisted Hop, or McGrath's Irish Black, or – well you get the idea by now. There might be good reasons why its not done, may be they tried before but there wasn't the demand. If so, given the explosion in the craft beer scene, may be now might be a good time to try again. This isn't a serious gripe, I love the Slieve and I'll be back either way, I just think there is an opportunity here for everyone. Anyway, back to the beers. 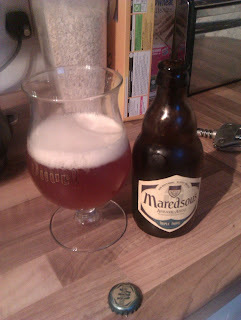 Maredsous 10. Style: Tripel, ABV: 10%. Description: Poured golden/honey with a decent head. Lacing stayed throughout. Slight yeasty/bready small with a citrus little fruit. Quite a sweet taste, but with a little spicy/tart (may be a little vanilla?) but not much sourness. Syrupy but light mouth feel. Thoughts: I really enjoy a Belgian tripel. This was a nice beer – but not as good as Tripel Karmeliet. Most tripels hide their ABV well, this one was slightly less subtle and came across slightly too boozy to me. A bit more fruit and a sour finish would have lifted a level. Solid beer though. Maredsous 8. Style: Dubbel / Belgian Brown, ABV: 8%. Description: Poured dark honey in colour with beige head that lasted. Smells of biscuit malts and brown sugar. Mid mouth feel, slightly syrupy. Toasted caramel and spice tastes, with some dark fruit and nuttiness. A little bitterness on the finish. Thoughts: Quite light for a dubbeI, started by hiding the ABV well but got slight thicker and boozier as it warmed up. This improved the overall finish of the beer. Very nice (if strong) beer. Schlosser Alt. 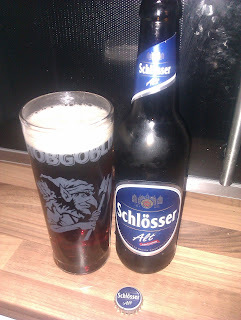 Style: Alt Bier, ABV: 4.8%. Description: Poured light brown, with a decent white head that dissipated quickly. Biscuit malt aromas. Slight burnt caramel tastes, a little hops, and quite a light mouth feel. Thoughts: Another new beer style. 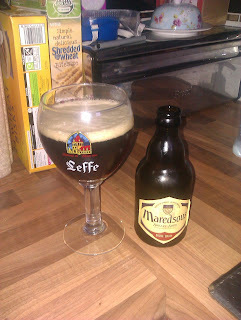 This hybrid beer is slightly lagerery with plenty of dark malt (a wee bit like anchor steam). Decent but not spectacular. Interested in trying more Alts. Skimshander. Style IPA, ABV: 4.5%. Description: Poured amber with with a small head that completely disappeared. Slightly bitter taste, with some light floral flavours and a little bit of grapefruit. Mid mouth feel. 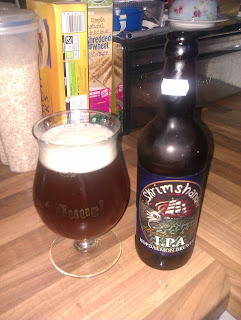 Thoughts: To me this came across more like an English pale ale, than an IPA. When I see IPA on a label I expect more hops, this was a wee bit too subtle for me.